Lying seems like a crisp black and white matter, at least the way we tell it to our kids. In other words, don’t do it! And yet that’s just not reality. Lying is a part of our development — learning how to fib is considered a growth milestone in children the same as learning how to walk or feed oneself independently. According to a 2002 University of Massachusetts study, 60% of adults can’t go 10 minutes in a conversation without telling a lie. Interestingly, men lied to make themselves look good, while women lied to make other people feel good. So is it ever okay to lie in the office? Some experts fall in the black/white camp, saying it’s never a good idea to fib. Once caught, you lose the trust of your co-workers and your boss. Frankly, I don’t think anyone can say they’ve never lied in the office. 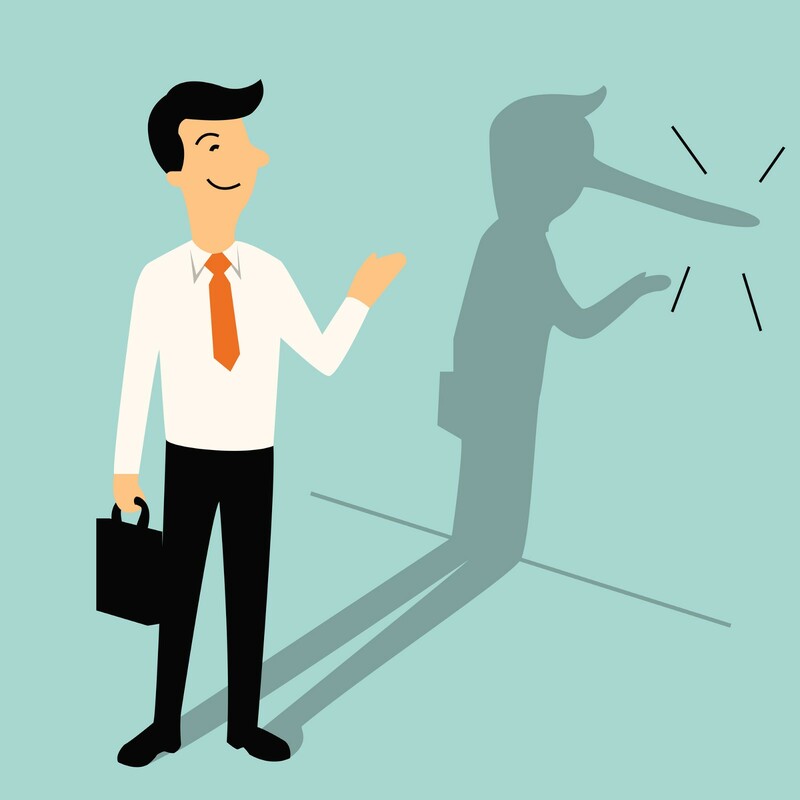 Big lies are huge no-nos like lying about your qualifications or taking credit for something someone else did. There are other times, according to experts, where lying is perfectly acceptable. 1. You’re hungover. OK, so you had a little too much to drink at your friend’s birthday party. And yes, you got only 2 hours of sleep. Much better to blame it on a bad back keeping you up at night than to tell your co-workers you’ve been up all night drinking. It makes you look bad and irresponsible, even if you know you can handle it. 2. You’re late. This is the most common white lie people tell. You’re running a couple of minutes late to a meeting because you basically couldn’t get yourself together to be on time. Instead, you blame traffic, the weather, a meeting that ran long, anything else than the real reason. It’s fine. People don’t honestly care about the reason for being late — they just want to see the sincerity that you feel bad for making them wait. 3. Quitting because you hate the job. Lots of people leave their jobs because they can’t stand their boss, the work, the pay, whatever it may be. Tempting as it might be to tell others how awful it was, it’s better to fib and tell folks you left for personal reasons or to grow in a different direction. Nobody will really believe that’s the exact reason but they’re also not exactly interested in hearing you lampoon your last employer either. And no future employer wants to hear you spew vitriol about your last boss — maybe Donald Trump can get away with criticizing everyone but you can’t. 4. Negotiating for anything. Every time you negotiate for something, you have to come in from a position of strength. But what if you don’t have that — you’re just a dinky one-person startup trying to attract your first customer; or you’re a low-level employee seeking a higher pay raise. In those instances, it’s okay to fib to make yourself look bigger than you really are. People are attracted and want to hire winners. Some do this in classic ways: i.e. talk about having “discussions” with third parties when all that’s been done is one email exchange. Or bump up their last salary by 10–20% to attract a higher one at the next job. It’s not exactly going to earn you a Boy Scout badge but it’s perfectly acceptable to do. 5. You don’t want to socialize. It’s always a good idea to bond with your co-workers or boss over dinner/drinks but sometimes all you want to do is get out of the office and go home. Rather than tell people you’d rather listen to dogs howling than go out with them for a beer, it’s fine to fib and say you’re going home to relieve the babysitter or you have a prior engagement. 6. You have to comment on someone’s appearance. There’s just never a good answer you can give someone who asks “do I look fat in this?” The truth is never going to set you free. So better just lie and tell someone at the office they look great or that the color is fabulous or some other lie you can live with. Commenting on someone’s appearance is deeply personal and even the smallest critique can be taken out of context. Better to just avoid this minefield. 7. When touching third-rail subjects. Some topics are better left outside the office. Anything related to politics, gun control, abortion is dangerous territory in an environment that’s meant to be neutral for employees. If someone starts quizzing you about your personal politics, it’s best to make light of the matter and move on. And sometimes if you find yourself with someone who expresses strong views you don’t agree with, it’s best to acknowledge and hope the conversation progresses elsewhere. But getting into it and going toe to toe is always going to end badly. Please join me on Radiate! We offer a snackable collection of videos featuring our experts to help solve problems, gain perspectives and learn new business skills. Sign up for a free day pass here and watch all our videos! Originally published at www.inc.com on February 5, 2016.